There are 4 color scheme choices, namely: grass, silver, earth and water as you can see in the above picture from top to bottom. There are also 4 style choices, namely: banner, cross, half and half and blocks, from left to right in the above picture. But that is not all. 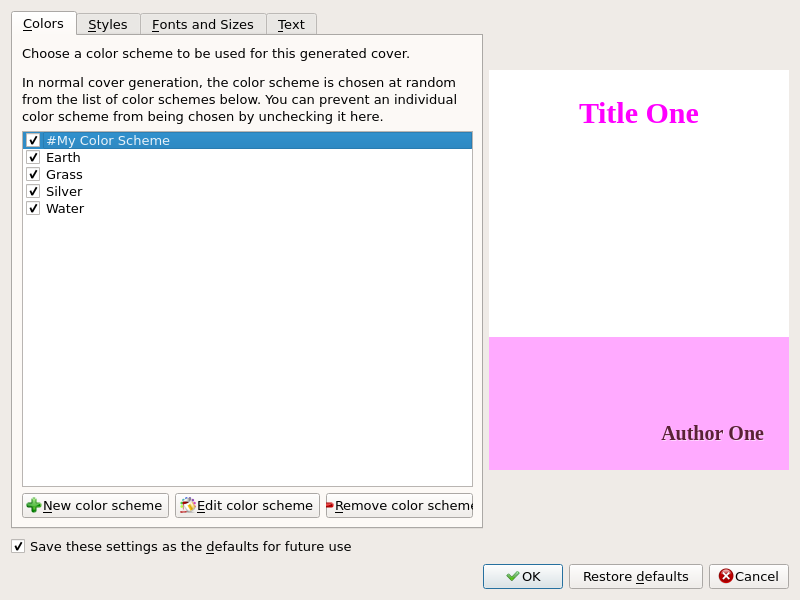 The color schemes can be customized to taste as can the fonts! 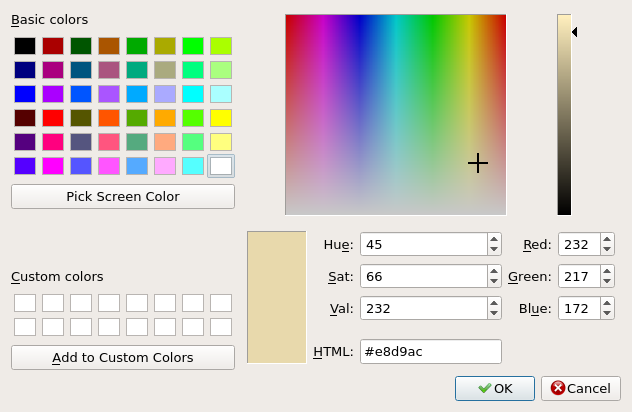 Now you see at the top of the list is the new color scheme i have created. 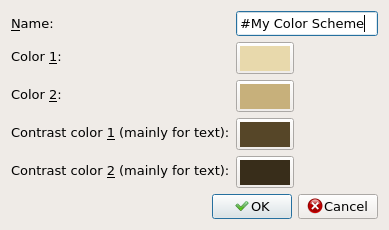 If you don't like it you can remove it by clicking the "Remove color scheme" button. I am going to save these settings for future use by checking the relevant box before clicking OK.
To change the title font click on the "Choose font family" button next to the "Title font family" entry. In the following I have changed the "Title font family" to "Purisa" and as you can see in the preview window below the font of the title has changed to Purisa. 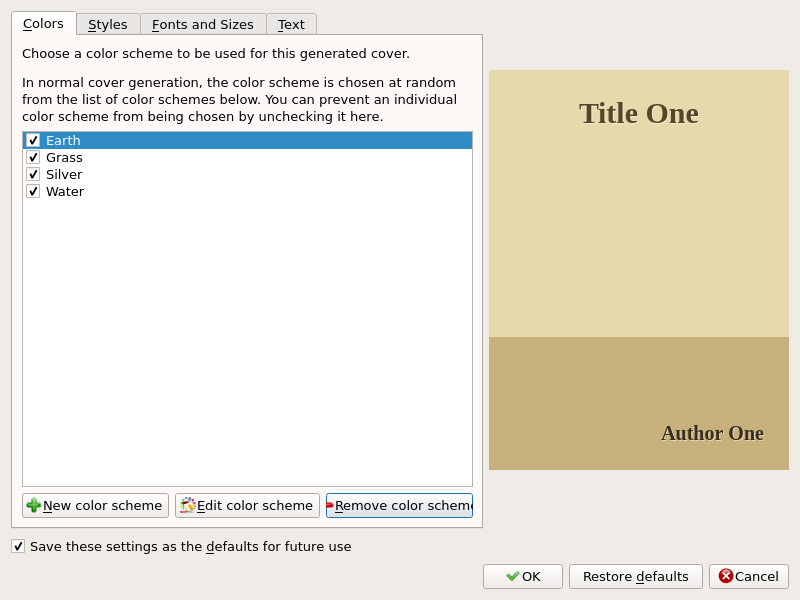 Similarly you can change the title font size. Below I have changed the title font size from 120 pixels as chosen in the above picture to 160 pixels. 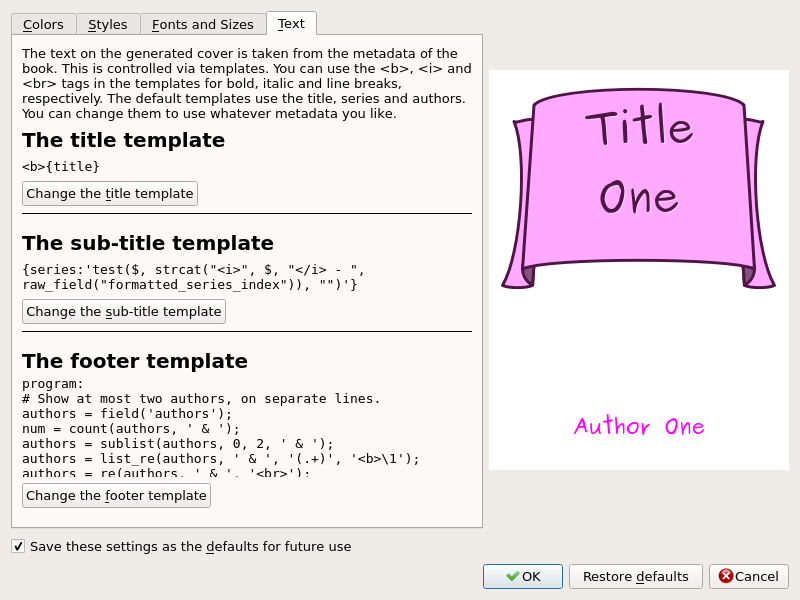 You can click on the change the template buttons to customize the Title, footer and subtitle information appearing on the cover. This post gives you the basics but there is a lot to play around with particularly in modifying the templates. Hope you have fun with this new feature. It has been about a year from our last big release, so it is time for another one. calibre 2.0 was released today. 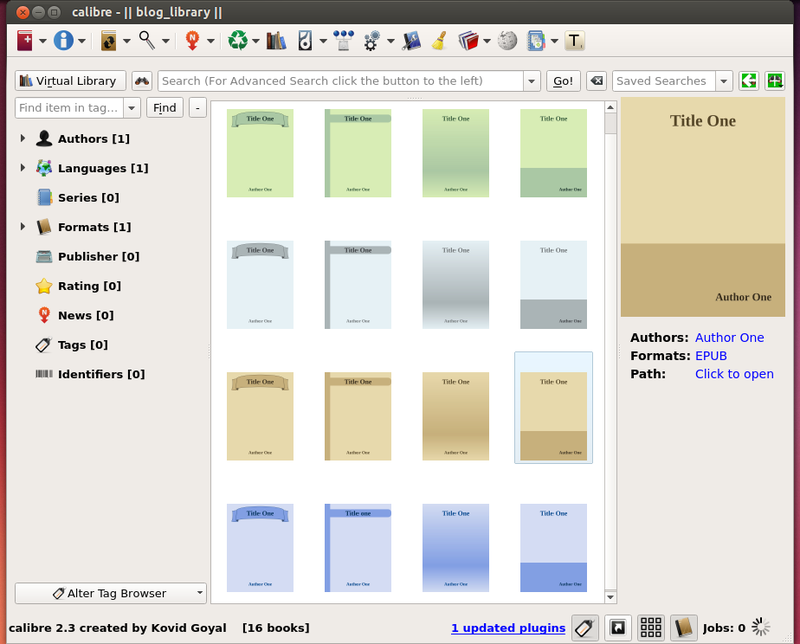 Since calibre 1.0 most of the development has focused on the e-book editor. calibre aspires to be the one stop solution to all your ebook needs. That is what we say on our home page. Until calibre 1.0, development mostly focused on the needs of e-book users. Sigil on the other hand, catered to ebook creators. But once the active development of Sigil came to an end, it was important to develop an ebook editor as well and that is what we have been doing for most of the last year. I made a detailed post about calibre's ebook editor when it was first released. Since then more functionality has been added to it which I will briefly discuss here. A video outlining the key features of the editor is available here. There have been some cool new features for e-book users as well. I will report some of the highlights in this post. For a comprehensive list of new features since 1.0 click here. Calibre 2.0 released today has support for Android phones and tablets on OS X, calibre should now detect and connect to them, just as it already does on windows and linux. The following is a list of improvements to the editor since my last blog post on the subject. For an introduction to the editor click here. The calibre book editor has built in spell check since version 1.33. You can install new dictionaries via Preferences->Editor->Manage spelling dictionaries. It comes with builtin dictionaries for English and Spanish. You can add OpenOffice dictionaries (in .oxt format). The tool checks spellings in all HTML/OPF/NCX files in the book, taking into account any language declarations in the book, so that it will work correctly on multi-lingual books as well. 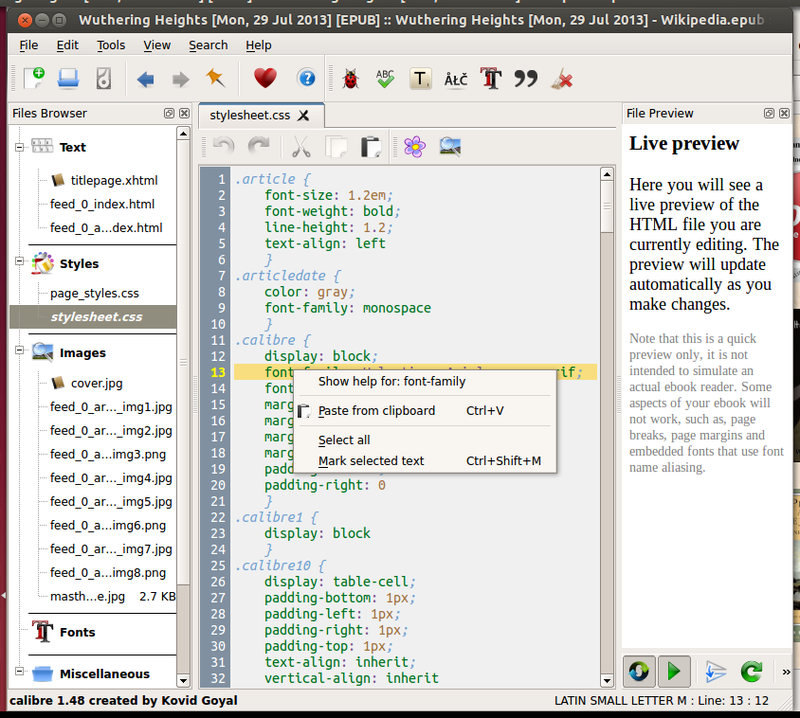 Live spell checking in the code view was implemented in version 1.37. Spelling errors are highlighted in the code view for convenient correction as you type. This can be turned off via Preferences->Editor. This shows you all unicode characters, simply click on the character you want to type. If you hold Ctrl while clicking, the window will close itself after inserting the selected character. This tool can be used to insert special characters into the main text or into any other area of the user interface, such as the Search and replace tool. Because there are a lot of characters, you can define your own Favorite characters, that will be shown first. Simply right click on a character to mark it as favorite. You can also right click on a character in favorites to remove it from favorites. 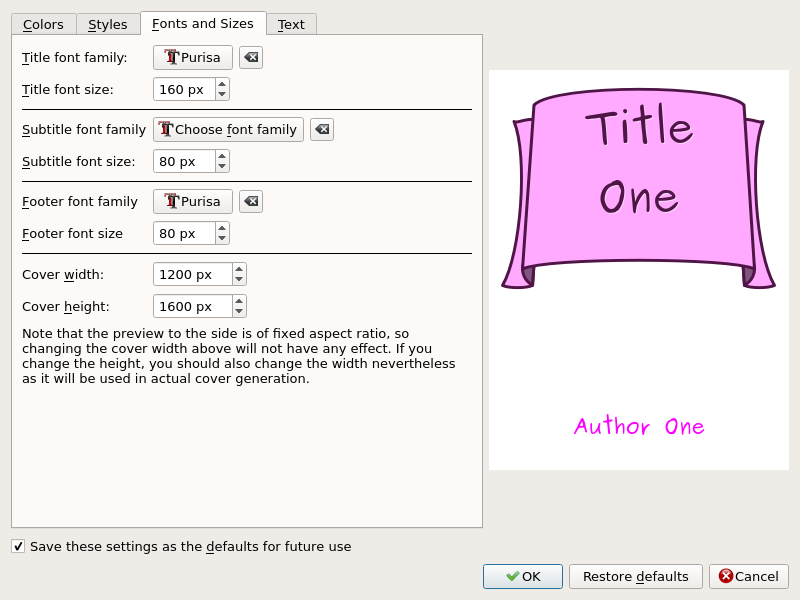 You can also directly type in special characters using the keyboard or by by using HTML named entities. For details click here. 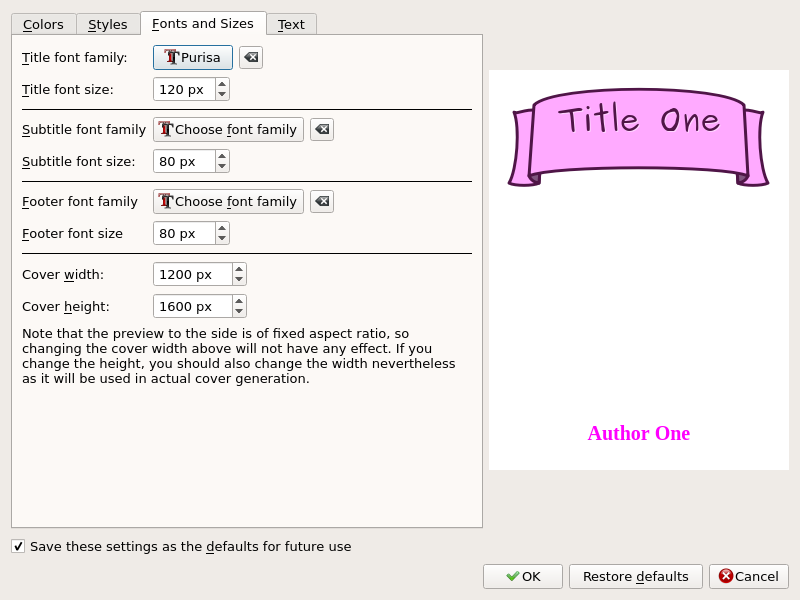 Now if you click on the first entry "Show help for: font-family" it will open this page in a browser. The same would happen if you right clicked on an HTML tag in an HTML file. 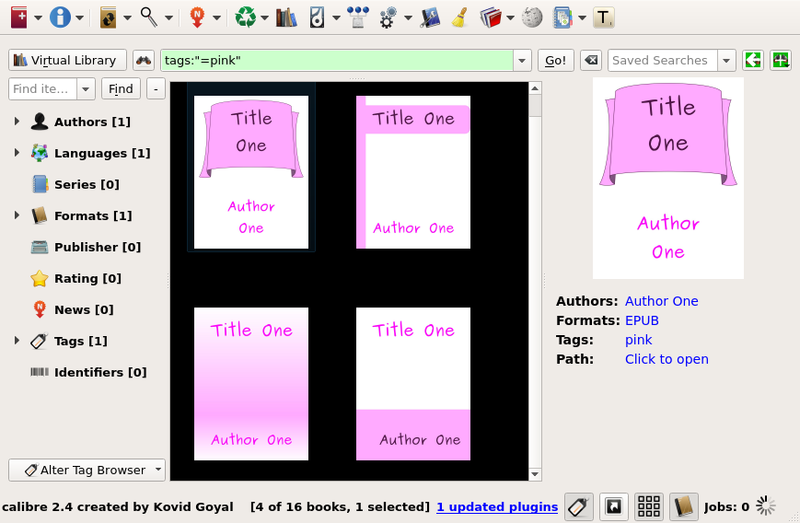 Since version 1.46 the editor supports plugins that can be used to extend its functionality. Documentation of the plugin API and an example plugin are here. 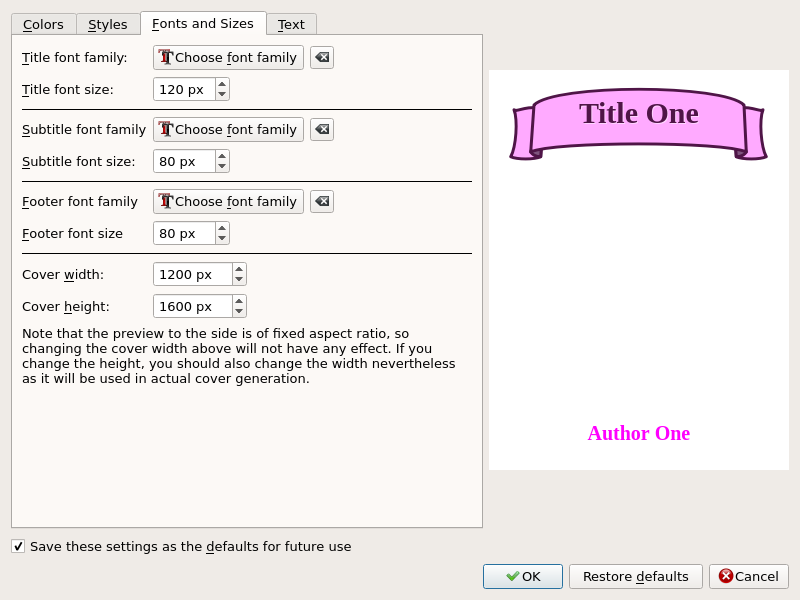 Since version 1.47, user defined emblems (icons) can be displayed next to covers in the cover grid mode. 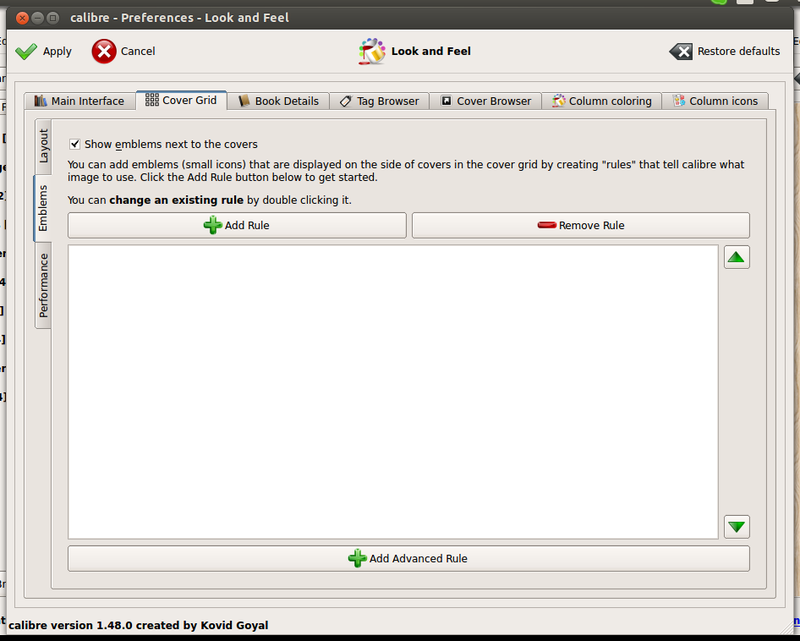 This is similar to the column icons feature introduced in version 0.9.17 discussed in this post. To add the image just click on "Add new image" and select the image stored in your files. In the above picture the books by Wodehouse, which I have also tagged as humor have both icons of "W" and the smiley face on top. The book "Press Cuttings", is not by Wodehouse, but is tagged as a satire has only the smiley face icon. 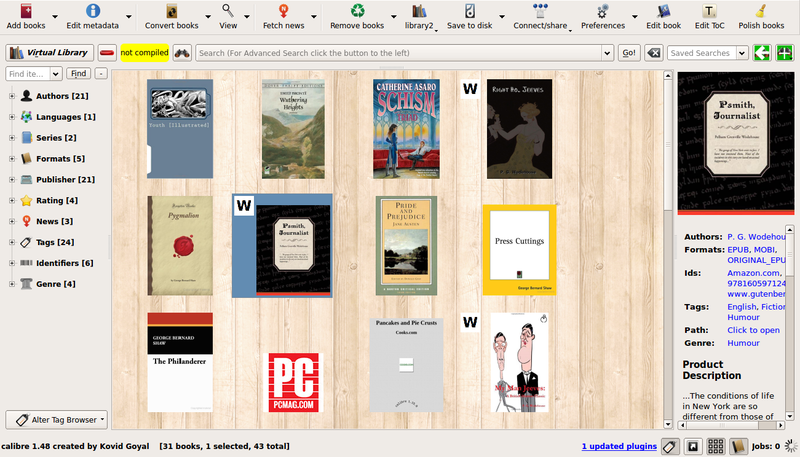 The location of the icon/s is not on the left as shown for the books by Wodehouse two pictures ago but on top. Also as you can see I have used the smiley face icon for multiple tags, i.e, humor and satire. You can do this by separating the different tags by a comma when adding the rule. Since version 1.25, calibre can read and write XMP metadata from PDF files. This means that all metadata that you can create in calibre, including custom columns, can be stored in the PDF files. It is also useful when importing PDF files created by some academic publishers, that sometimes have good XMP metadata, such as DOI identifiers, tags and so on. Since version 1.24 the builtin viewer in calibre supports touch screens on Windows tablets. You can tap or swipe to turn pages. Swipe up or down to jump between sections. Swipe and hold to flip through pages rapidly and pinch to zoom in and out.